ANOTHER DUNKEE JUST ADDED to the Chamber of Commerce Dunk Tank lineup!! CITIZEN OF THE YEAR GLENN PUTNAM HAS SIGNED ON TO SIT IN THE DUNK TANK FROM 6 TO 7PM TONIGHT!! Soooo, tonight’s lineup features Lisa Brandley from 5 to 6pm, Glenn from 6 to 7pm, Nikki Stevens from 7 to 8pm, and Kris Lowe from 8 to 9pm! WHAT A LINEUP!! $2/ball, 3 balls for $5, 10 balls for $10! 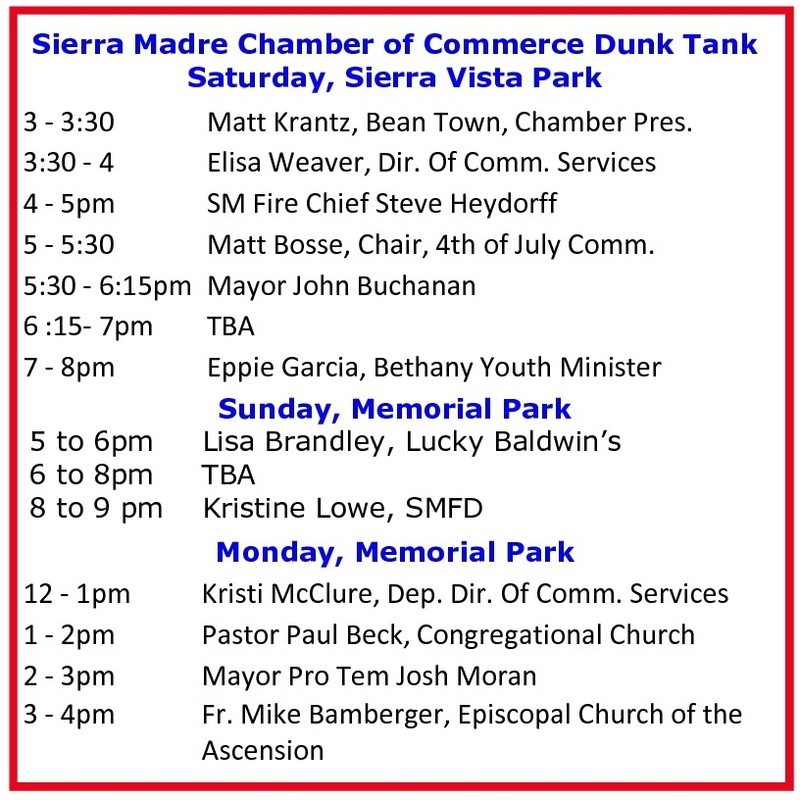 The Sierra Madre Chamber of Commerce will have a dunk tank operating this weekend, please stop by and throw some people in the water. Cost is $2/ball, 3 for $5, or 10 for $10. Still a couple slots open, dunkees to be announced, and schedule/dunkees are subject to change.